Nuclear prohibition: Why was Canada not in the room? 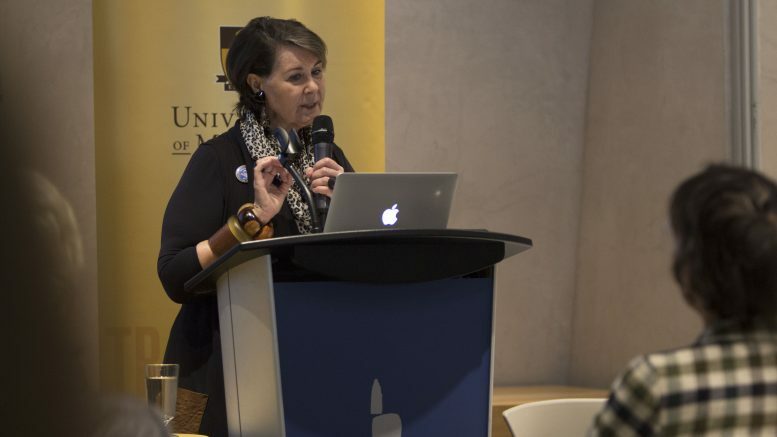 Independent Senator Marilou McPhedran delivers her keynote address at the "Human Dimensions and Perspectives in a Nuclear World," conference held for at the Canadian Museum Human Rights. Senator Marilou McPhedran – long-celebrated for being a pioneer in the inquisition and advocacy to promote human rights through systematic reform in law, governance, and education – visited the Canadian Museum for Human Rights Thursday. She presented a keynote address questioning the Canadian government’s disregard of joint-efforts of UN member states to implement the Treaty on the Prohibition of Nuclear Weapons. The address was part of a two day conference held at the Canadian Museum for Human Rights Oct. 12 and 13 to examine the human dimensions and political, economic, and social impacts of developing nuclear weapons both in peacetime and times of armed conflict. The conference was hosted by the University of Manitoba’s Robson Hall Faculty of Law, in conjunction with the International Law Association and the Round Table Strategic Forum on Nuclear Non-Proliferation. What should Canada’s position be? Starting on Sept. 20, the Treaty on the Prohibition of Nuclear Weapons began securing ratifications from the 122 countries that were signatories. Canada, in alliance with the nuclear-NATO members, primarily the United States, was not even in the room. The treaty, passed by the General Assembly of the United Nations in July, would prohibit the production, development, testing, and possession of nuclear weapons. The minimal presence of opposition to the treaty was unsurprising given the deliberate absence of the nine countries known to possess some form of a nuclear arsenal – the United States, Russia, Britain, China, France, India, Pakistan, North Korea, and Israel. Canada would be in opposition to NATO’s doctrine and the alliance by supporting the treaty, said Alyn Ware, founder of Parliamentarians for Nuclear Non-proliferation and Disarmament. However, Canada’s decision to not attend the negotiations on the treaty could jeopardize its bid to win a temporary seat on the UN Security Council in 2019. Canada’s dedication to NATO has been contested recently. In 2014, Stephen Harper’s Conservative government failed to meet the minimum spending quota – two per cent of GDP, which translates to $38 billion annually for Canada – for military spending set by NATO leadership. In April, Justin Trudeau’s Liberal government further curtailed defence spending to 0.88 per cent of the GDP. Canada’s NATO membership does not need to lead to a conflict in opposing the treaty. An example can be taken from the Netherlands, which, though a NATO member, attended the General Assembly’s negotiations but was the only nation to vote against opening the treaty for ratification. McPhedran questioned the integrity of disregarding the efforts of 122 non-nuclear member states and siding with its nuclear-armed allies that are against the complete prohibition of the weapons. Critics of the treaty, including Foreign Affairs Minister Chrystia Freeland, suggest the ban on nuclear weapons is ineffective because none of the nine nuclear powers have signed on. Only in recent years, through conventions held in Mexico, Austria, and Norway, has the international discussion on nuclear proliferation shifted from nuclear weapons as a deterrence to the humanitarian impacts of their presence and potential risks. Still, the Canadian government and its NATO allies maintain that nuclear weapons must remain at the core of their defence policy. Proponents of this argument point toward the seemingly unpredictable nature of the nuclear-armed North Korea. When asked about the response needed to the risk poised by North Korea’s current advancements, coupled with American president Donald Trump’s response and the potential impact of a fallout between the two nations, McPhedran was quick to point to the revival of diplomatic skills. “The kind of responses that are going to be required is either no response, because there is no one left to respond, or they are responses that are to a large extent non-nuclear,” she said. The Canadian government has taken a step-by-step approach to nuclear disarmament. This is highlighted by various initiatives supported by Canada, such as the 1996 Comprehensive Ban Treaty, Canada’s call for NATO leadership to review its nuclear policy throughout the latter stages of the 20th century, the Fissile Material Cut-off Treaty that was first proposed in 1993, and most recently, Parliament’s unanimous decision to encourage negotiations for a nuclear weapons convention. McPhedran – who is not entirely critical of this step-by-step approach – said she believes that, coupled with continued diplomacy, Canada could begin moving in the right direction. “If we were to just continue this so-called step-by-step approach, we just need more steps in the direction of a prohibition of nuclear weapons,” she said. The role of this position was to provide regular reports on all developments pertaining to the ongoing implications of past treaties and to maintain a strong Canadian position in the General Assembly against the proliferation of nuclear weapons. McPhedran emphasized the role young citizens have in pushing their governments to address certain issues. In this case, making sure that Canada’s absence from the treaty is not permanent. For example, the Netherlands was heavily pushed by its young citizens to attend the General Assembly negotiations. McPhedran said she is certain that today’s youth possess the means to become the game-changers in the arena of international affairs and governance. “This notion that your generation will be the leaders of tomorrow is simply wrong,” she said. “The vote alone in 2015 is a clear demonstration that that’s wrong to frame your generation as waiting, suspended for some tomorrow.